Our team of researchers, at www.TheTechnicalTraders.com, believe the recent upward price move in Gold has reached a level where prices will pause and retrace a bit before the next big leg higher begins. The recent downward pricing pressures in the US and global stock markets have prompted Gold to move well above recent highs near $1242. We predicted this move over 40 days ago with this research post. We still believe Gold and Silver are setup for a bigger move higher, yet we believe the recent upswing will briefly pause and retrace to levels we are showing, below, before attempting a bigger move to the upside. 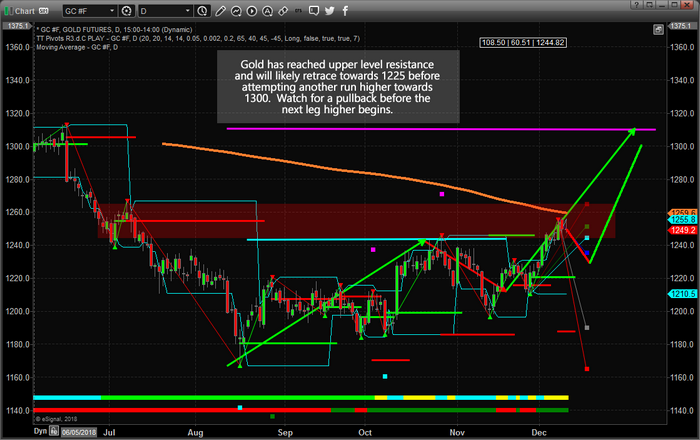 This Daily Gold chart shows our Learning Fibonacci modeling system and highlights three key resistance levels. We've also drawn a shaded RED range around the price levels predicted by our Fibonacci modeling system. As you can see, the current Gold price has reached beyond the CYAN and GREEN levels and is just below the higher RED level. We expect these resistance levels to briefly hold as price retraces back below $1230 (just below the BLUE support level). At that point, the bottom will likely be a very quick, “V” type bottom, and prices will likely begin to rocket higher into the end of 2018 and through the early part of 2019. 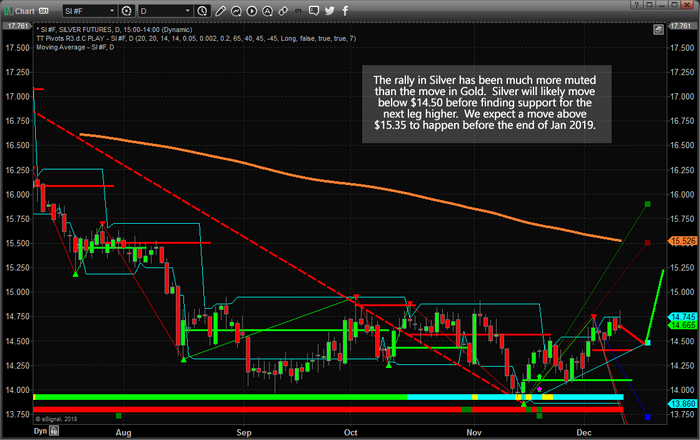 This Daily Silver chart, the “other shiny metal”, is showing how recent highs, near $14.80, are continuing to restrict the upside price movement. This resistance is similar to what we've seen in Gold and we expect a minor downside price rotation in Silver to play out before a much bigger move explodes higher. Our Fibonacci modeling system is suggesting prices are capable of rocketing towards $16.00 on a strong price breakout and we believe some level of fear will enter the global markets throughout the end of 2018 and into early 2019. This fear should push metals prices higher before briefly pausing near the end of Jan 2019. Our predictive modeling tools are showing us that this initial upswing in Gold and Silver will most likely stall between February & March 2019 before starting a much bigger and more explosive move in April~May of 2019. We will continue to alert you to new analysis when our modeling systems predict future price changes and this means we could continue to see increased volatility in the global equities markets for quite some time. Want to know how you can profit from these moves in the metals markets and other sectors of the stock market? Take a minute to visit www.TheTechnicalTraders.com to learn how we keep our members informed of future market moves using our proprietary price modeling systems and predictive modeling tools. We have dedicated many years and thousands of hours into developing some of the most incredible predictive modeling tools on the planet. Visit www.TheTechnicalTraders.com/FreeResearch/ to learn how we've been calling these markets and helping thousands of traders stay ahead of these market moves.